SACRAMENTO, CA -- Today, Governor Jerry Brown signed into law the landmark California DISCLOSE Act (AB 249), the nation's most comprehensive election disclosure law. "No more fine print," said the bill's author, Speaker pro Tem Kevin Mullin. "California voters will now be able to make informed decisions, based on honest information about who the true funders are of campaign ads. This transparency is critical to our democracy and I am proud that California has taken this historic first step to shine the light on 'dark money'. Hopefully this will encourage others to follow suit." Assembly Bill 249, authored by Assemblymembers Kevin Mullin (D-San Mateo) and Marc Levine (D-San Rafael), and sponsored by the California Clean Money Campaign, requires ballot measure ads and independent expenditure ads for or against candidates to clearly and prominently disclose the identity of their top three funders, and includes first-in-the-nation follow-the-money rules to make ballot measure ads show their true funders. 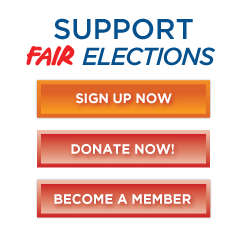 "With the quiet gesture of a signature, Governor Brown has loudly proclaimed California to be the national leader on the most important issue of our era: taking our democracy back from the special interests and restoring it to the people," said Trent Lange, President of the California Clean Money Campaign, sponsor of AB 249. "Every American who cares about democracy owes Governor Brown, Assembly Speaker pro Tem Kevin Mullin, and all the bold leaders in the California Legislature of both parties who helped AB 249 pass an enduring debt of gratitude." AB 249's overwhelming passage through the legislature also represents an uncommon bipartisan victory for campaign finance reform legislation that hopefully bodes well for the future, with every Democrat in both the Senate and Assembly joined by seven Republicans: Senators Anthony Cannella (R-Ceres) and Scott Wilk (R-Santa Clarita) and Assemblymembers Dante Acosta (R-Santa Clarita), Catharine Baker (R-San Ramon), Tom Lackey (R-Palmdale), Brian Maienschein (R-San Diego), and Marc Steinorth (R-Rancho Cucamonga). A crucial role in AB 249's passage was played by not only author Assembly Speaker pro Tem Kevin Mullin and joint author Assemblymember Marc Levine, but also by principal co-authors Senate President pro Tem Kevin de Leon (D-Los Angeles), Senators Ben Allen (D-Santa Monica), Jerry Hill (D-San Mateo), and Henry Stern (D-Calabasas), along with Assemblymembers Marc Berman (D-Los Altos), Matthew Dababneh (D-Van Nuys), and Adrin Nazarian (D-Van Nuys). The other 18 coauthors of the bill and Assembly Speaker Anthony Rendon (D-Los Angeles) were also key to its success. Robert Stern, a principal co-author of the Political Reform Act of 1974 and adviser on AB 249, said, "I am pleased the Governor signed AB 249. It represents a major advancement in disclosure on ads for both ballot measures and independent expenditures for and against candidates." Other leaders who played crucial roles in the ultimate passage of AB 249 are the previous California DISCLOSE Act authors who each moved the bill forward on different steps of the way over the last seven years, starting with then Assemblymember (and now Congressmember) Julia Brownley (author of AB 1148 and AB 1648 in 2011 and 2012), Senators Mark Leno and Jerry Hill (authors of SB 52 in 2013 and 2014), then-Assemblymember and now Congressmember Jimmy Gomez (author of AB 700 in 2015 and 2016 and original author of AB 14 and AB 249 this year). But the biggest thanks for AB 249's passage goes to the incredible grassroots and coalition movement that propelled the California DISCLOSE Act forward each year for the last seven years. The victory came after more than 350 organizations and leaders endorsed AB 249, over 100,000 Californians signed petitions, tens of thousands of Clean Money supporters sent emails, many thousands made phone calls, hundreds packed hearing rooms, and other outpourings of grassroots activism. Unheralded but heroic Clean Money leaders who worked on the California DISCLOSE Act for years include dedicated, unpaid volunteer coordinators like Gary Appell in Marin County, Suzie Arnett in Stockton, Craig Dunkerley in San Jose, Ellie Garabedian in Fresno, James McCord in San Diego County, Nancy Neff in Palo Alto, Teresa Priem in the San Fernando Valley, David Schmidt in San Francisco (and beyond), David Sonneborn and John Goodman in Orange Country, Shirley Shelangoski in the East Bay Area, Kevin Wolf in Davis, and countless others. They were organized by a small but hard-working California Clean Money Campaign and California Clean Money Action Fund staff including Catherine Ashworth, Katherine Carpio, Trent Lange, and D'Marie Mulattieri. "It is both fitting and unsurprising that this landmark, against-all-odds legislative victory for democracy was won the same way our republic was secured: by thousands and thousands of passionate volunteer Americans who selflessly devoted -- as in the final sentence of the Declaration of Independence -- 'their lives, their fortunes and their sacred honor' to the cause," said Trent Lange. "Make no mistake about it, this was people power in action and this landmark victory belongs to those countless heroes who made phone calls, wrote emails, made signs, raised small contributions, and raised big hell until the legislature passed AB 249 and Governor Brown signed it."